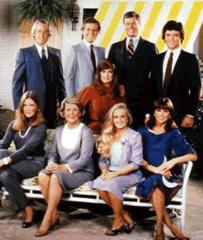 Performers include: Larry Hagman, Patrick Duffy, Ken Kercheval, Victoria Principal, Linda Gray, Steve Kanaly, Barbara Bel Geddes, Charlene Tilton, Howard Keel, Susan Howard, Deborah Rennard, Sherill Lynn Rettino, Sheree J. Wilson, Deborah Tranelli, Omri Katz, Priscilla Presley, Don Starr, and Audrey Landers. A very popular nighttime soap opera that follows the wealthy Ewing family of Dallas, Texas. The family’s oil business is run primarily by the sons of tough patriarch John Ross “Jock” (Jim Davis) — the immoral John Ross “J.R.” (Larry Hagman) and moral Robert “Bobby” (Patrick Duffy). Daddy Jock is married to strong matriarch Eleanor “Miss Ellie” (Barbara Bel Geddes) while son J.R. is married to a former Miss Texas, the long-suffering Sue Ellen (Linda Gray). In true Romeo and Juliet fashion, son Bobby falls in love with and marries Pamela Barnes (Victoria Principal), sister to the Ewing’s biggest competitor, Cliff Barnes (Ken Kercheval). Other characters include granddaughter Lucy (Charlene Tilton), Southfork Ranch foreman and Jock’s illegitimate son Ray Krebbs (Steve Kanaly), Ray’s wife Donna Culver (Susan Howard), and Miss Ellie’s second husband Clayton Farlow (Howard Keel). Dallas: What Past Storylines and Characters Should Be Revisited? Please bring back Dallas, the new generation. How about this: If the new Dallas will not be renewed,how about bringing back the “old one”,and running it everyday,say,for at least 2 or 3 episodes? That would bring some pleasure to some of the older folks ,who remember the first time it was on primetime tv! I am now one of those,”older folks”!!!!!!!!!!! !